Choose “Apply for Auto, Visa or Personal Loan,” then choose the type of loan you want to apply for and follow the prompts. 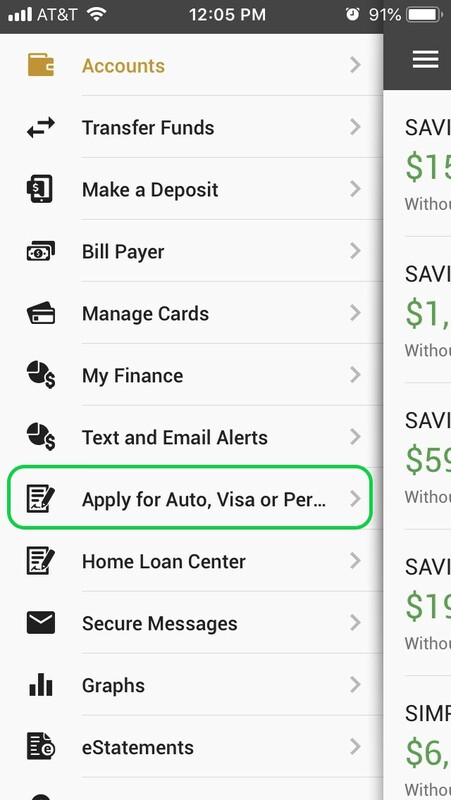 If you don’t already have the Mobile Banking app, you can download it here and enroll for access right on your device. Choose the “Apply for a Loan” tab, then “Start a New Application,” choose the type of loan you want to apply for and follow the prompts. Applying for a Visa Credit Card? Please read this first. Please review membership eligibility information here. Or, if you prefer, you can call us or visit any Qualstar branch location to start an application. Please visit our Home Loan Center for current rates and to apply. 1 If you do not already have Home Banking access, you can sign-up on our home page and have immediate access to apply. 2 New member applicants must be Washington residents. Loan rates and terms are based on each individual’s credit history, LTV, and Qualstar lending guidelines.